In 2003 I took up beading again. I had worked fairly extensively with seed beads as a child, and have done a few things with Polymer clay years ago. I started with kits, then basic stringing of beads (crimp and toggle), then progressed to complex patterns, and have now branched into more extensive wireworking. This page is a slide show - to start the slideshow click on the first thumbnail image you want to see, and then click on the current picture to advance to the next. Newest jewelry is shown first. Made almost completely by hand including wirework on a jig to match this shirt. Pendant is attached with an O-ring clasp so that it can be removed. 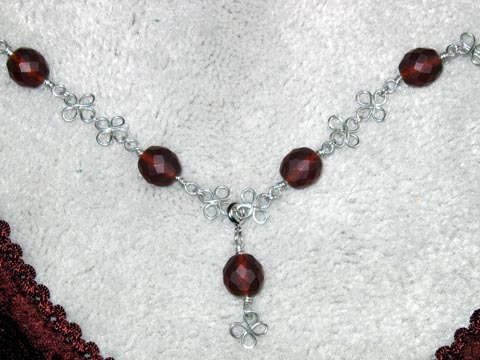 The set I made to wear at Christmas 04. Charm bracelet is made from scratch (including chain) except for the clasp and O-ring clasps attaching silver charms (so they can be reused with other colors). Simple necklace made from glass beads with a removeable pendant (a Christmas present). Same pendant, with rose quartz. Glass with wirework clasps and wrapped beads. Jasper pendant with all original wirework in copper and brass. Green glass with tiger-eye chips. Glass beads with handmade wirework clasp and earrings. Wire wrapped delicate bracelet for my sister Simona. Versatile red and soft pink necklace for my mother-in-law. Wine and Water Glass Charms I made for my brother-in-law - the look on his face when he thought I made him earrings was priceless! Made for my sister-in-law Vicki to match her performance dress. Original polymer class bracelet made in a class by Sharilyn Miller. My first extensive wirework. Made with Amber from my mom, Bali-style and glass beads from Michaels, and miscellanious seed and other beads. Notice the extender - necklace has two sizes. Amber colored set - beads from Bead Retreat and Michaels; Earrings are wire-wrapped real amber from my mom - my first wire work.